Hybrid sugar baby type watermelon. Rind is black and tough while flesh is red and has high sugar content. Harvested around 80~83 days after sowing. Average fruit weight is 7.0~8.0kg. 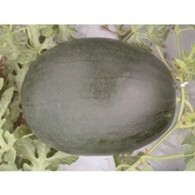 A sugar baby type watermelon hybrid with average fruit size of 6~10kg. 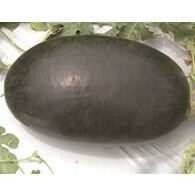 Its fruits are globe shaped with solid dark green color skin. Maturing in 75~80 days from sowing. The flesh color is red and the sweet taste makes this watermelon highly marketable. A sugar baby type watermelon hybrid. Excellent flesh texture. High sugar. Superior transportability. Average fruit weight is 6~8kg. 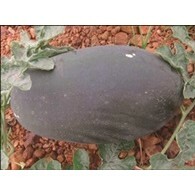 Early maturing variety which fully ripens in 65 days, weighs 3kg and is oblong shaped. Its crispy red flesh has excellent eating quality. Attractive pure black skin. 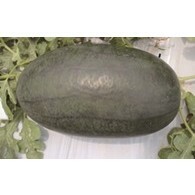 Oval shaped watermelon hybrid with dark green colored skin which has netting on it. Dark red flesh is high in sugar content and has good eating quality. Average fruit size is 3.0~4.0kg and shows good uniformity. 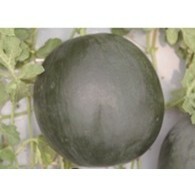 Hybrid ice box type watermelon F1 with bluish black skin. Fruit shape is cylindrical with indistingtive stripes. Average fruit size is 2.5~2.8kg with high 14 brix and good texture. Good shelf life. 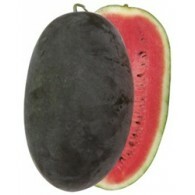 Hybrid ice box type watermelon F1 with bluish black skin. Fruit shape is cylindrical with indistingtive stripes. Average fruit size is 3.0~3.3 kg. good sugar, 14 brix and excellent texture. Good transportability. Thin & tough rind. Hybrid ice box type watermelon F1 with black skin. Fruit shape is cylindrical with indistingtive stripes. Average fruit size is 2.5~3.0 kg. High brix 14 and excellent crispy texture. Rind is thin and tough. Good transportability. 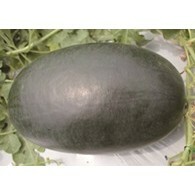 Icebox type watermelon variety with 65 days maturity. Oblong shape. Blackish green skin with indistingtive stripes & dark red flesh. Fully ripen watermelon weighs 2~ 3kg, which is very small in size. Easy to pack and box. Mini watermelon early variety with 65 days till fully matured. Blackish green skin with indistingtive stripes. It has red flesh with supreme sweet taste. Oblong shape and weighs 3~4 kg. 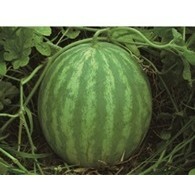 Ice Box type hybrid watermelon with light black skin and stripes. Fruit’s shape is oblong and the flesh color is bright red. High in sugar and crispy. An oblong shaped watermelon with relatively small size. The fruit weighs 3~3.5 kg when fully matured and has rind with blackish green color and stripes. Its flesh is red colored and has delicious sweet taste. 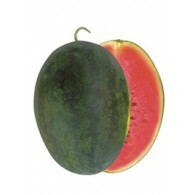 A seedless, round shaped watermelon has long maturing period of 100~110 days. Fruit’s skin is green with deep green broad stripes while its flesh is red as well as high in sugar. Its fruit weighs about 8~12 kg.